First and foremost Cascadia is a life-place. Historically, the people of each land have been an integral element of that place’s life. We need only examine the ecologically adaptive cultures of indigenous populations to witness this. In the dominant culture, we have lost our way. We have detached ourselves from the very land that provides life and we no longer know a home. Arbitrary boundaries have separated us from both culture and place, but we have underestimated the power of the songs coming through. There is a resurgence of bioregionalism that extends across many lands. Many people are listening to the bioregion where they reside and initiating community once again. Voices from all walks of life acknowledge that we are infinitely dependent upon nature for survival, and many are questioning loudly why we continue down this path of recklessness. Every place on Earth exists within a bioregion. Every bioregion has been sustaining life in its own unique way. To inhabit a land base requires listening to the laws of the land in that particular place. A bioregion is defined by the organic patterns and natural characteristics of a specific place. It is the unique hydrologic cycles, the watershed, the land, the geology, the soils, the very flora and fauna, the culture of the peoples that weave its whole together. Its periphery is not defined by any arbitrary line, but by the rhythms that encompass it. Cascadia extends from northern California to southern Alaska. It reaches inland from the Continental Divide of western Montana and expands to the coastline of the Pacific Ocean. It includes all of Washington and portions of Oregon, British Columbia, California, Idaho, Alaska, Alberta, Montana and Wyoming. The people of Cascadia are gradually aligning themselves with this place. We are diverse in opinions, stories and backgrounds. We are divided only by fundamentalism. If we truly want to provide life for future generations here, including the salmon, we must let go of preconceptions and stand in solidarity grounded in our most obvious commonalities. We need the fisheries, we need the rivers, we need the forests, we need the mountains, we need community. Cascadia embodies all of our needs. The human pursuit to live simply, to belong, to have community, to know one’s tribe, to live free from oppression and exploitation, to live in harmony with life, to celebrate life, has manifested throughout life choices in Cascadia. These desires are evolving into the characterizing layers of this emerging culture. For many, it appears that the land itself has been the guiding force. There is also an indigenous population that has been clinging to exist since the arrival of the dominant culture. They have watched their land be decimated and they have watched their lifeblood dissolve, as so many cultures have endured. Indigenous populations, the world over, have continually been fighting towards the right for life to exist.² Let us recognize this necessity and strive for what we all have been stripped of. We need not ask anyone to stray from their heritage, but ask everyone to embrace this emerging culture in tolerance and understanding so that we may all heal from our deepest wounds. Cascadia exists; it always has and it always will if we demand it. This means listening to the songs of place and acknowledging the severed connections that encompass our lives. By examining the myriad of constructs in our lives and working towards resilient and purposeful communities, we have the potential to restore not only the land, but also ourselves and ways of being in the process. Restoration must become actualized in place and thus begin building models for communities and economies to transition towards interdependence. This land of sacred waters has songs bursting out of its very essence. It is time for each of us to bring our gifts forward and sing in a unique way. 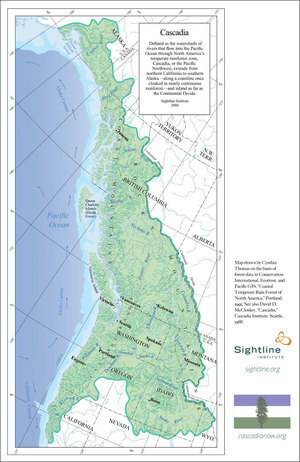 Cascadia is waiting for the people of this land to become aware of its existence. Are you ready? This essay is from Casey, Devin & Mel from Cascadia Matters, released in 2012, and the creators of the Occupied Cascadia documentary. Cascadia Matters was a film and educational collective in Bend, Oregon dedicated to a radical and real decolonization of the Cascadia bioregion by those living here, and a true solidarity with First Nations and indigenous cultures and ways of living.